Documents from the Federal Bureau of Investigation (FBI) surveillance of the Ecuadorian left in the 1940s as part of the project on the FBI in Latin America. Forwards sample of Fourth International propaganda allegedly circulated in Ecuador by either by German or Spanish Legation. Source: Letter from J. Edgar Hoover to Adolf A. Berle, Jr., "Communistic propaganda in Ecuador," Washington, D.C., May 18, 1942, Despatch no. CC-285, Record Group 59, 822.00B/61, NARA. Early FBI report on communist activity that doesn't find evidence of Russian organizers. Source: Letter from J. Edgar Hoover to Adolf A. Berle, Jr., Washington, D.C., July 29, 1942, Despatch no. CC-285a, Record Group 59, 822.00B/62, NARA. 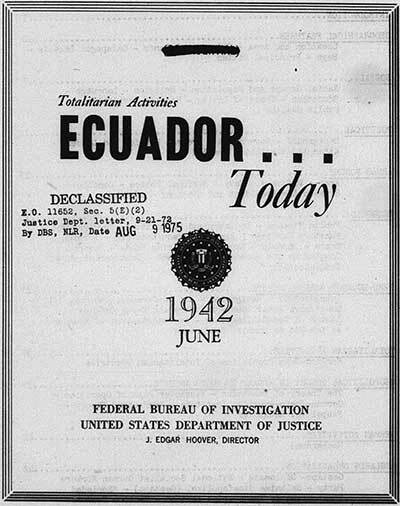 Federal Bureau of Investigation (FBI), Ecuador ... Today (United States Department of Justice: Federal Bureau of Investigation, June 1942, pdf, 25MB). Monograph on nazi influence in Ecuador, including a broader discussion of the economic and political situation in Ecuador in the 1940s. Source: Franklin D. Roosevelt, Robert Lester, and Dan Pinchas, FBI reports of the Franklin D. Roosevelt White House, Research collections in American politics (Bethesda, MD: UPA collection from LexisNexis, 2007), microform, reel 18, frame 0416f, microfilmed from FBI Reports—Ecuador. Hopkins Papers, Special Assistant to the President, Box 142. Detailed report on communist activities from FBI's legal attaché in the US embassy. Source: Letter from Robert M. Scotten to Secretary of State, "Communist activities in Ecuador," Quito, August 14, 1943, Despatch no. 339, 822.00B/67, National Archives Records Administration, College Park, Record Group 59, Central Decimal File 1940-1945, Box 4319. Copy of report from a confidential reliable source. Since the end of June 1943, the principal events of interest are release from jail of Saad, and formation of ADE with PCE. Source: Letter from J. Edgar Hoover to Adolf A. Berle, Jr., "Communist Activities in Ecuador," Washington, D.C., September 11, 1943, Despatch no. CC-285a, Record Group 59, 822.00B/69, National Archives and Records Administration (NARA), Washington, DC. Six-page report on communist activities in Ecuador. Source: Letter from J. Edgar Hoover to Adolf A. Berle, Jr., "Communist Activities in Ecuador," Washington, D.C., September 21, 1943, Record Group 59, 822.00B/70, NARA. Information on communist activities in Guayaquil. Source: Letter from J. Edgar Hoover to Adolf A. Berle, Jr., "Communist Activities in Ecuador," Washington, D.C., November 18, 1943, Record Group 59, 822.00B/75, NARA. Report on anti-fascist organizations in Quito. Source: Letter from J. Edgar Hoover to Adolf A. Berle, Jr., "Communist Activities in Ecuador," Washington, D.C., January 26, 1944, Record Group 59, 822.00B/78, NARA. Detailed report on communist activity, including trotskyist and free Europe groups. Source: Letter from J. Edgar Hoover to Adolf A. Berle, Jr., "Communist Activities in Ecuador," Washington, D.C., April 7, 1944, Despatch no. #64-200-12-10, Record Group 59, 822.00B/79, NARA. Reports on communist leader Pedro Saad's plans to travel internationally for labor conferences. Source: Letter from J. Edgar Hoover to Adolf A. Berle, Jr., "Communist Activities in Ecuador," Washington, D.C., May 18, 1944, Despatch no. #64-200-12-19, Record Group 59, 822.00B/81, NARA. "Ecuadoran Government Fears Revolt Prior to National Election, June 2 and 3, 1944," Washington, D.C., May 27, 1944, Record Group 59, 822.00/1730, NARA (pdf, 1MB). "Possible Revolutionary Action in Ecuador," Washington, D.C., May 29, 1944, Record Group 59, 822.00/5-2944, NARA (pdf, 1MB). "Revolution in Ecuador," Washington, D.C., June 2, 1944, Record Group 59, 822.00/6-244, NARA (pdf, 1MB). "Revolution in Ecuador," Washington, D.C., June 2, 1944, Record Group 59, 822.00/6-244, NARA (pdf, 3MB). Documents from the FBI surveillance of the secretary general of the Ecuadorian Communist Party. Documents from the FBI surveillance of a Central Committee member of the Ecuadorian Communist Party.